Just a few photos from the fantastic Big Draw today... see more images in the gallery on the School website. The pictures were displayed in St Michael's Church over the weekend. Gardening Club were very sad to say goodbye to Mr Seeley, who after few years of helping, advising and guiding the gardening club at school, has hung up his fork and moved onto pastures new. Mr Duggen’s invaluable help was also marked as we had a small party in the community gardens to celebrate. Mrs Hopkins and Mrs Robinson made some delicious treats. We then set to work on the final tidying up of the beds and borders. All the dead sunflower, bean and pea plants were pulled out with great gusto and placed on the compost pile. The canes were all sorted, tidied away with all the twine being removed. The Brussel sprouts were left to continue to grow over the winter months and wait for the frosts. We are looking forward to next Spring when gardening club begins. We were pleased to get together again on Friday 14th October when we were joined by some more Year 5 children to prepare and cook their savoury dishes. We knew we were in for a treat looking at the menus of Courgette and pea soup, Vegetables au gratin with crumbed salmon, Spiced vegetable biryani and Homemade burgers with sweet potato chips. The children cooked completely independently again, impressing us with their skills and knowledge. We were particularly impressed by the safe use of the blender with the hot soup, the co-ordination of timings for the salmon and vegetable dish, the range of delicious ingredients and knife skills used for the biryani and the knowledge and understanding demonstrated when making and cooking the homemade burgers. It was delightful to hear the children chatting to each other this week too, asking what they were each doing and learning from each other. Mrs Cooper was very glad not to be judging! Each week the children have amazed us with their confidence, knowledge, skills and flavours. The results will be announced after half term but a HUGE well done to everyone who took part and special thanks to our guest judges who have had a very difficult task. We are already looking forward to next year's competition! It was the turn of some of our Year 5 and Year 6 children to impress us in the Hitcham's Head Chef competition on Friday 7th October. What a week! The children prepared Chocolate mousse, French pear cake with chantilly cream, Banana fritters with fudge sauce and Rhubarb fool. An impressive range of skills were on show from separating eggs, whipping, melting, folding, baking and even deep fat frying! The children excelled themselves and displayed an astonishing amount of knowledge and confidence. Well done all! The results of the Hitcham's Head Chefs competition will be announced after half term. The Year 6 children continued to wow us on 30th September by returning to our classroom kitchen to cook their sweet dishes. An ambitious selection of dishes were prepared once again demonstrating an impressive level of knowledge and skill. The children worked with such focus to create Choc chip cookies with cream and raspberries, Millionaires shortbread, Gluten free profiteroles filled with chocolate and raspberry truffle and Fruit scones with homemade raspberry and blackberry jam all completely independently! The judges certainly had their work out. The results are to be announced after half term. Our Year 6 pupils had a packed afternoon yesterday with the Crucial Crew team. They were given sessions with the Fire Service, Police Service, Health Service and a power company, to understand about dangers around us, both at home (eg fire hazards) and outside (eg power cables) and also about health dangers (eg the amount of sugars in drinks) and much more. They also had some basic first aid training and had a go at putting each other in the 'recovery position'. A very important and informative time for the children. Today the children showed their thanks to Mrs Ward who has been our Chair of Governors for the last few years and has been a school Governor for 16 years. 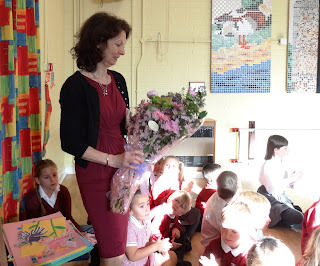 The children made her some wonderful 'Thank You' cards and presented her with a bouquet of flowers. We will miss her but are so grateful for the work and support she has given the staff and pupils over this time. We wish her well for the future. Our new Chair of Governors is Mrs Julie Clarke who has been on the Governing Body for 4 years. Rev'd Mark Sanders has been elected as Vice-Chair. Class PLKV are having weekly music lessons with Miss Cochrane from the County Music Service. This includes the opportunity to learn to play the clarinet; the children are very excited at being given an instrument on loan to practise at home too. The children in PLKV, LC & RH were lucky enough to have a fantastic history day today, they were visited by Lady Catherine (Cathy Murphy from the ‘Gripping History’ company), who led workshops on medieval clothing, food and manners, heraldry and scribing. The children also looked at medieval armour, and took part in a re-enactment of the Battle of Hastings, which originally took place 950 years ago this week..... history really was brought to life today. The school has been lucky to benefit from the CO-OP Community Token scheme this year, where their customers can vote for local organisations with their green token. We were delighted to receive a donation of £300 which the school have used to purchase digital weather stations (one for each class), and hand held weather vanes (ten of these) plus display materials for an informative wall display about the school’s findings after using our new equipment. A splash of colour for next Spring! Gardening Club were busy planting up bulbs ready for the Spring next year. They learnt what to look for on the packets of bulbs ie when to plant them, how deep to plant them, when they flower and how tall they grow. The children then set to in planting up their own pot. First the base was covered with compost where the tulips were planted as they had to be the deepest (10cm). Then after a small layer of compost the crocus bulbs were placed (8cm) and then after the final layer of compost the Fritillaria (Snakeshead) bulbs were carefully placed (5cm). All the pots will be watered and kept outside so that next spring the plants will push up through the compost ready for a beautiful staggered display from February through to April. On Thursday afternoon the school hosted the annual HSSSP Girls Football competition on the sports field. The competition featured 7 local schools including two teams from Framlingham. Both Framlingham teams displayed great skill, etiquette and teamwork throughout the afternoon with the 'B' team achieving notable victories against Earl Soham and Wickham Market and the 'A' team finishing deserved winners of the competition by winning all of their matches, scoring a large number of goals and conceding none against. By winning the tournament the school qualify for the County Finals in January. Thanks and congratulations to all players on their excellent results both individually and as team members. Thanks also to Mrs Owen and Mr Skeggs for looking after both teams so well on the day and to all parents who attended and supported. An impressive start to the year!